I love knitting cables. I love gadgets. I’m always looking for new gadgets and things to try out in my knitting. New techniques, new ways of doing old things. Actually I just love knitting, but then…. Cables can turn an ordinary panel of stockinette stitch into a decorative, dressed up, eye catching piece. But what is the easiest way to do cables? First of all, they’re not hard at all. You can either follow charts or written out directions. I recommend becoming proficient at both, that way you’re not left out in the cold. These are some of the gadgets in my cable arsenol. A double pointed needle can be used to take the “unused for the moment” stitches off of the working needles and held in front or back. 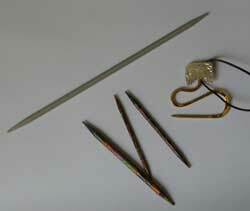 A cable needle can be used. 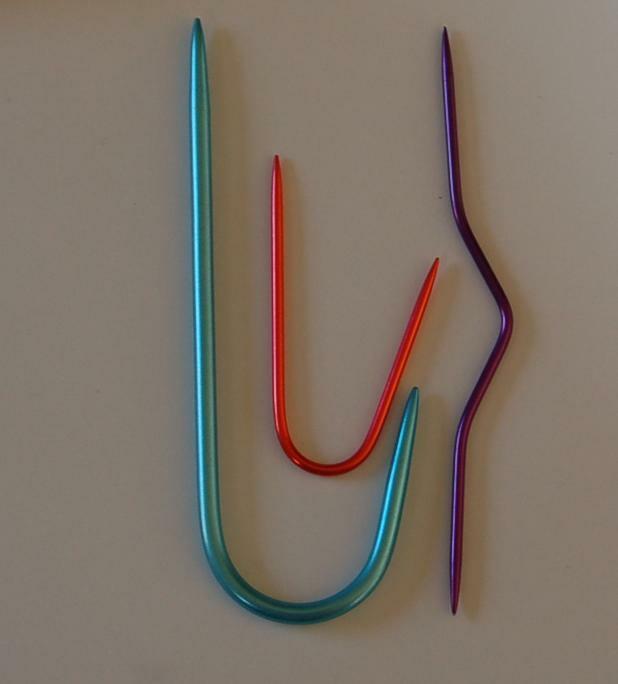 These are sometimes bent to hold the stitches better and keep them from falling off. 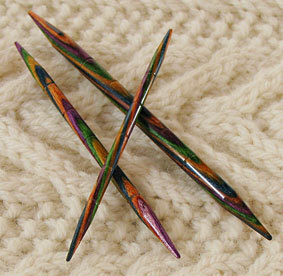 One of my favorite gadgets is the Harmony Cable Needles, available from Knit Picks. These are beautiful, smooth, lightweight, ridged to hold the stitches, and they feel soooo nice in my hands. Did I mention they are really pretty? That’s important too! Asthetics are valuable in a hobby. This Cable Needle Necklace from Leslie Wind is a pretty and functional piece of jewelry, it hangs long enough to be useful, but easily shortens without taking it off. Smooth metal makes it easy to hold on to your unused stitches, and the twists and turns keep the stitches from falling off. I’ll admit to using a sharpened pencil from time to time to hold stitches. After the disaster/tragedy that was 9/11 when all manner of pointy objects were banned from airplanes, I took two pencils, sharpened them and coated them with 2 coats of clear nail polish just so I could knit while flying. Not perfect, but hey, a girl’s gotta do what a girl’s gotta do. 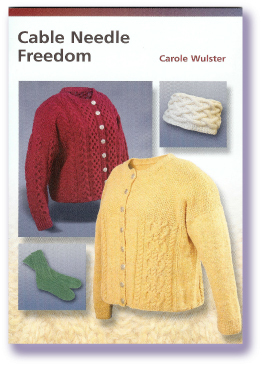 And then, right in the middle of my love affair with gadgets, I find this: An Ebook by Carole Wulster called Cable Needle Freedom. What? Free from cable needles? And you can go faster? Because, face it, fast is good too, especially when you have quite the line up of knitting projects going on. Carole’s book not only teaches you how to read a cable chart, which is a good thing, too many knitters are intimidated by these, but it teaches you how to cross cables without a needle. Outrageous! And, on top of that, she leads us through 3 different excercises that, when done, produce almost a full hat. A swatch with a purpose! I’m not one to favor swatches, oh, I do them, because I’ve wasted a lot of time and money by not doing them, but I’m not crazy about them. I also had a chance to preview Janet Szabo’s Fall 2008 Twists and Turns Newsletter. This Fall 2008 newsletter, sent via mail or electronically (doncha just love the digital age?? ), is packed with patterns and color pictures for sweaters, a scarf and an afghan. She also demonstrates how to do a cable techique I’ve never heard of. Elongated cables! These really look fun, yup, you guessed it, one more thing to do on my never ending list! Her newsletter features both charts and row by row intructions for her patterns. Cables! They’re not hard, and the sure can dress up your knitting. Take a cable to lunch!